An algorithm in ADL can be designed as an Order Ticket Algorithm (OTA) which means that the algorithm can be launched directly from the MD Trader window instead of using the Algo Dashboard. While the normal routine of starting algorithms through the Dashboard requires the user to perform several preparatory actions, the OTA functionality reduces such pre-launch process. For this reason, the OTA functionality is especially useful for strategies which require fast "single-click" style of execution. ADL will automatically recognize an algorithm as an Order Ticket Algorithm if the algorithm contains an Instrument Block defined as an Order Instrument. Make sure to save the algorithm. Before the algorithm can be launched, it must be deployed onto an Algo Server. 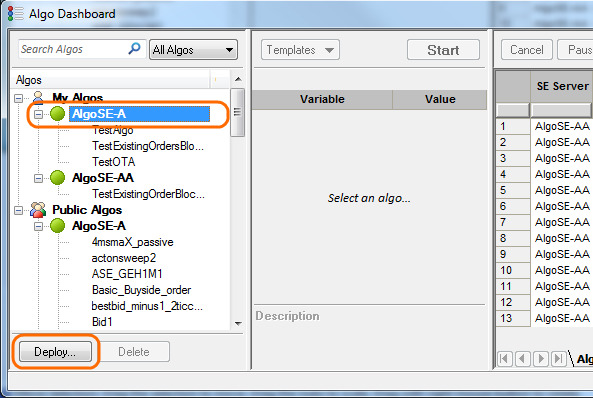 To do this, open the Algo Dashboard, select a desired Algo Server, and then click . A deployment window will be generated. Using the left column, navigate to the saved OTA, and then click . The right column will be populated with the selected OTA. 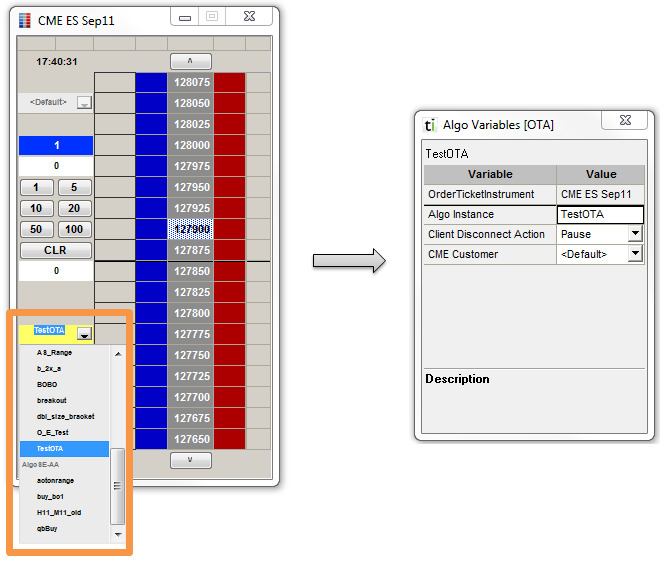 The drop-down menu located at the right edge of the dialogue window will display the Algo Server selected in Step 1. However, the user may use this drop-down menu to change the server selection at this time. Click to deploy the selected OTA onto the specified Algo Server. Algo Instance: Any algorithm in ADL can launch multiple instances at once. Use this field to name and distinguish each instance. Client Disconnect Action: This drop-down menu allows the user to dictate the behavior of the algorithm upon a disconnect, whether the disconnect was intentional or not. The "Leave" option instructs the algorithm to continue operating. The "Pause" option instructs the algorithm to pause and delete all working orders, but retain the output values of certain blocks so that the user may resume the algorithm from the paused state. The "Delete" option instructs the algorithm to stop its operation completely. Assign a value to the Order Side Variable: If the user clicks on the bid side column, the Order Side Variable will be set to BUY, otherwise, the variables will be set to SELL (see: Flip For Sell Order Functionality for more information). 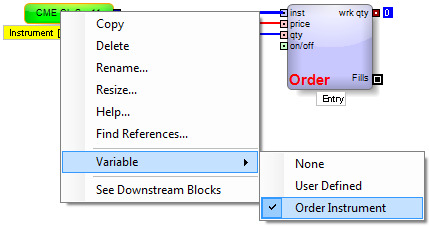 Assign values to the Constant Number Blocks designated as Order Price Variables: Any Constant Number Block designated as an Order Price Variable will be assigned the price level specified by the user's click. Assign values to the Constant Number Blocks designated as Order Quantity Variables: Any Constant Number Block designated as an Order Quantity Variable will be assigned the default quantity shown on the respective MD Trader window. Assign an instrument to the Instrument Blocks designated as Order Instrument Variables: Any Instrument Block designated as an Order Instrument will be assigned the instrument of the respective MD Trader window.